The wastewater industry has known for years that wastewater and raw sewage contain an abundance of dangerous bacteria, viruses, and parasites. Continuous exposure to these pathogens poses a health risk to sewer workers, and a number of industry organizations, including OSHA, have finally acknowledged this fact. Public health officials have recently alerted the public to a new health risk posed by antibiotic resistant bacteria, commonly known as “super bugs.” These “super bugs” are resistant to treatment by our current arsenal of antibiotics. Medical experts have also warned us that new antibiotic drug development is at an all time low, with no guarantee of future success. At the same time, viruses are busy changing their genetic structure and reproducing new forms of themselves. The results could be equally dangerous. Of particular interest to our industry is a new wastewater study finding"MRSA," a highly dangerous “super bug,” in three out of four wastewater treatment plants tested. “Super bugs,” previously confined to hospital isolation wards, are now commonly found in sewer lines and wastewater treatment plants. Cleaning sewer lines exposes sewer workers to these “super bugs” and other viruses. MRSA infections are responsible for over 20,000 deaths a year in the US. Cantalupo PG, et al. 2011. Raw sewage harbors diverse viral populations. mBio 2(5):e00180-11. doi:10.1128/mBio.00180-11. The Vanguard System removes up to 98% of bacteria and viruses found on the jet hose. 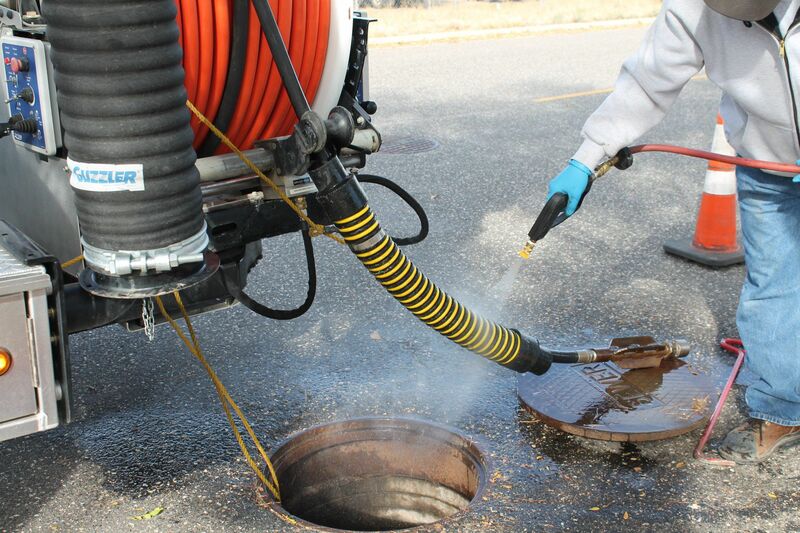 The ‘jet hose’ is the component of a sanitary sewer truck handled most often by wastewater workers; therefore, it is the primary culprit behind the transfer of bacteria and viruses from the sewer to the operator. In addition, the Vanguard System provides a spray nozzle attachment that allows the crew to apply the same anti-bacterial, anti-viral solution (Sani-Solution™) to the work area, external controls, and commonly touched surfaces on their truck. It also gives sewer workers the water volume and “big time” cleaning and killing power required for effective SSO clean up. The Vanguard System’s modular design makes it easy to mount on any make of Combination, Jet, or CCTV Truck. With the push of a button, it pumps Sani-Solution through a delivery hose to a lightweight manhole roller or spray nozzle attachment. The Vanguard System costs only a few dollars a day to operate, and the investment is offset by reductions in lost time due to illness, health insurance premiums, liability exposure, and employee morale. Constructed from stainless steel, "6061" aircraft aluminum, and the highest quality electrical and mechanical components, the Vanguard System is trouble free and built to last – proudly made in the USA.